In driving rain, brake lights suddenly illuminated an Italian motorway. Then the screaming started. A UK family have told the BBC of their terror, after being caught up in the collapse of a bridge in Genoa on Tuesday which killed at least 39 people. Nicola and Lisa Henton-Mitchell, from Bicester, Oxfordshire, were four days into a three-week holiday with their two children when they were forced to abandon their hire car and run for their lives. Speaking from the hotel where they spent Tuesday night, she recalls the chaos as people fled to take shelter in a tunnel. “I was driving. The rain was so severe you could only see a few cars in front of you,” Lisa said. Traffic suddenly came to a standstill. “Everyone’s red lights came on,” Lisa said. “Then it seemed like seconds later the reverse lights came on. People closer to the site of the collapse ran towards them, shouting and screaming. The family ran back towards the tunnel through which they had recently driven. “When we ran from the car my daughter didn’t have her shoes on,” Nicola told the BBC. The couple’s daughter has a disability which affects her mobility, but it was not possible to carry her. “Car doors and lorry doors were being opened constantly,” Lisa adds. Soaked and frightened, the family took shelter in the tunnel with other survivors. Few could speak English, so it was difficult to get information about what had happened. Fortunately, the family encountered a Belgian couple who could translate. “They kindly gave the children some dry tops to put on,” Lisa said. Police officers pulled drivers to one side and started the process of recovering the vehicles they could reach. But Nicola and Lisa’s car was too far away. “We were just around the bend,” Nicola said. 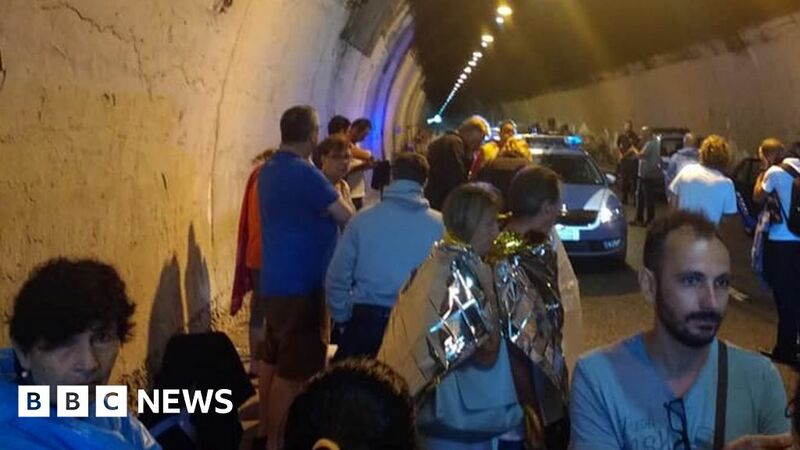 A bus transported the people sheltering in the tunnel to a civic centre in Genoa. The authorities provided people there with water, clothes and blankets, while a volunteer helped them to find a hotel. In the hotel, exhausted, the children were able to sleep. “We’ve tried to shield them from how serious it was,” Lisa said. The family asked their travel insurance company to fly them home but they have refused. They have little more than their money and passports, but are thankful to all the “truly lovely, kind people” who have helped them.